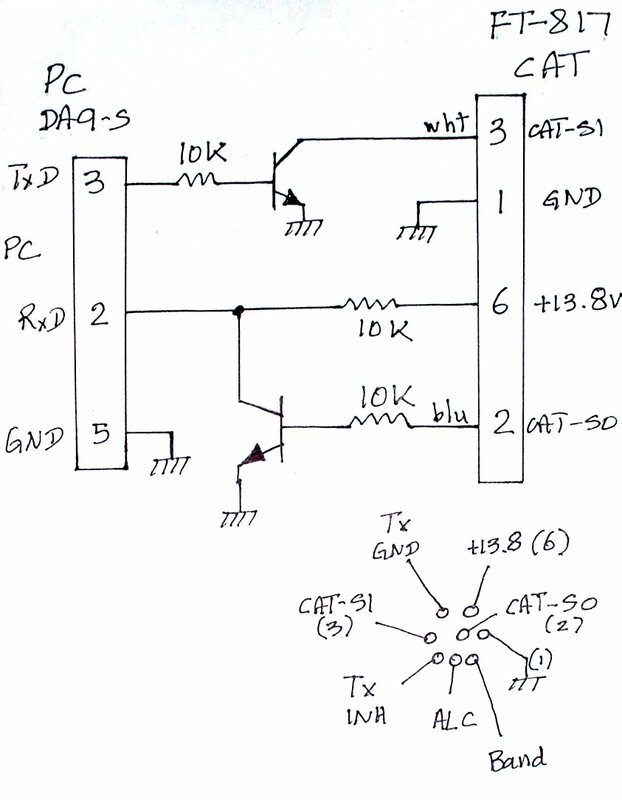 Here is the schematic of the simple CAT interface I use with my FT-817. It is very simple and takes power from the FT-817 itself, so you want to make sure it is unplugged when you run off batteries. It does not meet the EIA-232 standard for the output voltage, but I have not found a computer made in the last 10 years that did not work well with it. With this interface, the output voltage is 0 or about +13V, where EIA-232 requires that the voltage be either more negative than -3VDC, or more positive than +3VDC. I hope you are as lucky as I am. This interface works well in conjuction with my Dual Radio Interface described elsewhere.